The “Got No Strings” campaign also features PARTYNEXTDOOR and Pharrell. Apple's decision to kill the headphone jack with the iPhone 7 was a controversial one. A lot of people were upset with the move but the tech giants are sticking to their guns and today, October 17, have launched a campaign designed at getting users to convert to a wireless way of living. 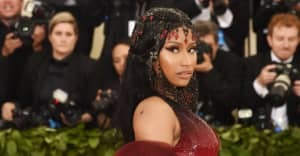 Nicki Minaj, DJ Khaled, Pharrell, Travis Scott, and err, Steve Buscemi are among a mixed group of famous faces all showing off Beats By Dre's range of wireless headphones. Young M.A. offers an OOOUUU in the direction of a girl that catches her eye, while Amber Rose struggles to stay upright. PARTYNEXTDOOR, meanwhile, dances with his dog. The whole thing is set to “I’ve Got No Strings” from Disney’s Pinocchio. Michael Phelps, Rebel Wilson, Karlie Kloss, and Ben Simmons also feature in the ad, which you can see above.